My interest in the relationship between literature and the visual arts is due to a series of circumstances which André Breton might have recognized as hasards objectifs, or if one prefers to use Carl Jung’s terminology, synchronicities, defined as follows: an apparently meaningful coincidence in time of two or more similar or identical events that are causally unrelated. The first instance brings me back to the summer of 1967 when I entered graduate school at Carleton University in Ottawa. As a graduate teaching assistant I was assigned an office which I shared with Roger Isaacs who was at the time revising his MA dissertation on Baudelaire and Delacroix. We only had a few weeks together before Roger left for the University of California at Irvine where he was to pursue doctoral studies under the tutelage of Renée Riese Hubert who was later to publish Surrealism and the Book. I have no idea what became of Roger after he left Carleton, but those few weeks had piqued my curiosity, and my interest has remained unfailing to this day. In 1969, just months before I left Carleton, the library acquired Walter J. Srachan’s The Artist and the book in France; the 20th century livre d’artiste which had just appeared in print that year. I found it, literally, on the new books shelf and immediately signed it out. I entered a new world where art and poetry not only met, but intermingled, collided even. We are no longer talking about book illustration where the text and the image exist in a mimetic relation, where the artist transcribes in his own medium the text or narration. Such books have always been important in our lives and remain as important today. But in the livre d’artiste, the mimetic relation tends to disappear in favour of a freer interpretation of the text by the artist, or of the writer interpreting visual artists. At the limit, the livre d’artiste becomes an objet d’art in itself. More on this subject can be found in the following article. A year or two later, on my first visit to Paris, as a further coincidence, I happened on an substantial exhibition of some livres d’artiste at the Bibliothèque Nationale and I was once again madly in love and determined there an then that one day I would see the publication of my own livre d’artiste. I allowed myself to dream the impossible dream. In 1974, I reviewed a show entitled The Calgary Printmakers then on exhibition at the Edmonton Art Gallery. Of the four artists whose works were on display, two were francophone, Lucien Compernol and Francine Gravel. I published an article on both of them in the local French newspaper, Le Franco Albertain. Meeting Francine Gravel was the last of those synchronicities mentionned earlier, and the beginning of a friendship and collaboration that has lasted to this day. 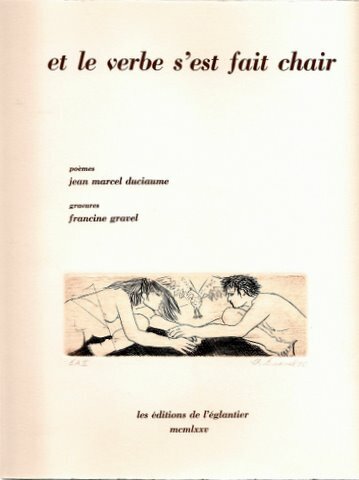 In 1975, we published Et le verbe s’est fait chair (And the Word Became Flesh), a collection of twelve of my poems and thirteen of Francine engravings (including the title page). We had worked independently on a theme and eventually, in one sitting, married the poems and images that would become our own livre d’artiste, a dream come through. As always, one thing leads to the next. I eventually contributed more articles on the relationship between art and literature, on Québec and the livre d’artiste, on small presses in Canada, and on Emily Carr’s literary and visual work. And at times things go full circle, and I had the privilege of being invited back to France to share my interest in various conferences. Until next time, I bid you farewell.